The show- Images by Joe Mazza at Brave Lux Photography. Hi The Neo-Futurists, “Redletter + Burritos” looks wonderful! I'll be in town for a few days and I'm wondering if you could host me. Thank you! Spice up your Friday. 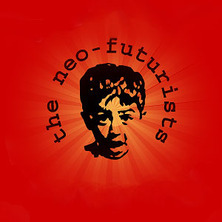 Join The Neo-Futurists for an evening of dinner and a show!! The Neo-Futurists will provide the entertainment, and Meal Sharing will provide the homemade food. From the creators of Too Much Light Makes the Baby Go Blind! Digital technology allows journalists to capture the defining moments of our time quickly and comprehensively. But is faster necessarily better? Is modern journalism living up to its expectations? Redletter looks at the plusses and pitfalls behind the most recent evolution of the press and delves into the ensemble members' complex relationship with the news. The Neos examine digital journalism with their signature mix of intelligent humor and poignant drama. Featuring Neo-Futurists Bilal Dardai, Trevor Dawkins and local live lit favorites Lisa Buscani, Lindsay Muscato and Thea Lux. Our lovely theater in the heart of Andersonville.